Majd Mashharawi and Rawan Abddllaht are behind these new-styled bricks, called ‘GreenCakes.’ The duo had dreamt of creating this type of material during their university days while studying engineering. They were not satisfied with the materials already being used in Gaza because they were flimsy and not sturdy enough to build sustainable, long-standing constructions. Instead, they set out to create their own building blocks using local materials to make inexpensive but durable building bricks. GreenCakes are made from recycled ashes, where the weight of the block is half of that of a normal brick. They are priced 30 percent less than typical bricks and are environmentally friendly. 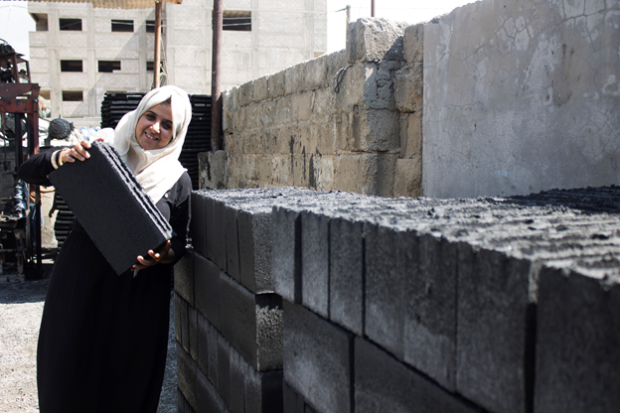 Majd and Rawan are about to scale up operations for mass production, having calculated that that about 18,000 houses in the area need rebuilding and that Gaza needs at least 40,000 bricks every day, making their product a real business solution. They were also concerned about the byproduct of coal combustion that they believe results in 10 tons of coal ash in Gaza dumped each week, contaminating limited groundwater supplies. For months, though often doubted by their own community, they researched how to substitute rock and sand with coal ash and concrete rubble to make lightweight bricks. Frustratingly, time and again their bricks failed compression tests, but soon they had success. Now GreenCakes has launched a crowdfunding campaign to help them increase production of their lightweight bricks. In this campaign, they want to develop these building blocks further, in order to improve their specifications, so that they can create a mini-production line in Gaza, to help rebuild communities faster that have been destroyed through the three wars. These talented young women are not only building a business from the ashes of environmental destruction and war, but also lives. Earlier this year, Majd and Rawan participated in and tied for first place in the Japan Gaza Innovation Challenge (JGIC), hosted by the United Nations Relief and Work Agency for Palestine Refugees In the near East (UNRWA). The Challenge focuses on how entrepreneurial ideas can contribute to a brighter future for Gaza in 2050. It provided an opportunity for all the participants to have access to and network with Japanese investors and social entrepreneurs. Both the UNWRA and the Japanese were impressed by GreenCakes. These two women are having a positive impact here, not just with eco-friendly construction, but also in pushing boundaries and breaking stereotypes about women in Gaza.